If burning pain or chronic tingling sensations in your neck or limbs is interfering with your usual activities, you may have a pinched nerve. 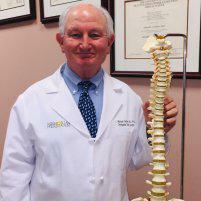 J. Michael Graham, Ph.D., M.D., offers diagnostic nerve tests in-office at Northwest Spine Center in The Woodlands, Texas, to identify the cause of your pain. In most cases, Dr. Graham will also order radiological imaging studies to establish a diagnosis. He focuses on the best course of treatment to relieve pain and prevent permanent nerve damage, including options for physical therapy and minimally invasive surgery. Don’t delay treatment for chronic pain of a pinched nerve. Schedule your consultation today online or by phone. Your nervous system consists of two parts: the central nervous system, which includes the brain and spinal cord, and the peripheral nervous system, which travels throughout all areas of your body. A number of factors can influence the health of these nerves. When underlying medical conditions cause inflammation or you suffer a direct injury to an area of your body, these nerves can become compressed, or pinched, resulting in chronic pain and mobility issues. In some cases, a pinched nerve is only temporary. If the nerve remains under constant pressure, it can result in permanent nerve damage. If your symptoms and physical exam are suggesting of a pinched nerve, then Dr. Graham will order radiological imaging studies such as an MRI scan to determine the anatomic cause of the pinched nerve. EMG tests and nerve conduction studies are also helpful in evaluating the health of your nerves. This type of test measures the signals that travel through your nerves to determine if you have nerve damage. Once Dr. Graham identifies the source of your pain or neurological symptoms, he creates a custom treatment plan to help alleviate the problem. What treatments are available for a pinched nerve? Initially, Dr. Graham may recommend resting the area to reduce inflammation and ease the pain. He may also suggest physical therapy to strengthen your muscles and reduce pressure on your nerves. If you need immediate pain relief, Dr. Graham may suggest over-the-counter pain relievers and anti-inflammatories, or administer steroid injections. In situations where nerve damage has already occurred due to constant compression, Dr. Graham may recommend surgery to release the trapped nerve. A number of surgical techniques, including minimally invasive surgery, are available to meet your needs. If minimally invasive techniques aren’t suitable for your condition, Dr. Graham also offers many traditional surgeries to address the root cause of your pinched nerve. The goal of surgery is to provide you with long-term pain relief and enhanced mobility. Following surgery, you may need additional physical therapy sessions to ensure your recovery fully. Find out more about treating a pinched nerve by calling the office or conveniently booking a consultation with Dr. Graham online.